You know when someone you completely in love with dumps you unexpectedly & out of the blue, and you are a total basket case for a while, going through the motions of life but not really focused? This is kind of what Arsenal's 2005-06 season had been like from its inception to mid-February. 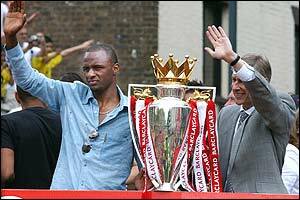 The breakup that rocked its world was the departure of 9 year starter/legend/talisman/Arsenal God Patrick Vieira(PV4), who suddenly left the club last summer(I won't even go into why this happened, becasuse it is a 5000 word essay in and of itself, and asking 10 different supporters will get you 10 different answers). After finishing no worse than 2nd in the Premiership in each of the last 8 seasons, while also winning the league in 98, 02, and 04 and winning the FA Cup in 98, 02, 03, and 05, Arsenal were (by these ridiculous standards) rubbish for much of the season. All year they have languished in 5th - 9th place, their chances to challenge for the title were completely gone before Christmas, and they are currently fighting tooth and nail to finish 4th in the league and thus qualify for the Champions League next year, a huge deal both or the financial windfall and the ability to keep their best player(and one of the 3 best players on the planet), Thierry Henry, from leaving in the summer to join another club. They have lost 10 league matches already this season(32 played); in the previous four seasons they lost a total of 14 league matches(152 played). A combination of life without PV4 and the inability of some veteran players to play anywhere neat their regular form (Ljungberg, Pires, Campbell, Gilberto) left Arsenal blabbering on & on the phone to their friends at all hours of the day or night about how they were done wrong and how things will never be the same. Arsenal didn't eat or sleep for a few months, and all of Arsenal's friends were worried about the 20 pounds he lost and how thin he looked in the face. "Arsenal/Arsene looks awful - he hasn't eaten or slept in days..."
But then, like all of us before, Arsenal woke up one day and they were OVER IT. They let go of the past and moved on, once again confident in their abilities and themselves. The day in question was February 21, 2006, when, after a period of good day/bad day results due to throwing incredibly talented but incredibly young players into the pool and letting them sink or swim, a young & massive underdog Arsenal team travelled to Madrid to face the most successful club in European football history, Real Madrid, and their galacticos Zidane, Ronaldo, Beckham, et al., in their legendary stadium, The Bernabeu (80,000 seats). Real Madrid have won the European Championship a record 9 times; Arsenal had never even made it past the quarterfinals. It all came together on this day - they played brilliantly, and the amazing Thierry Henry shook off 4 different Madrid defenders before slotting coolly past Iker Casillas to produce a legendary 1-0 win for Arsenal. This marked the first time ever that an English team won a match against Real Madrid at The Bernabeu. Holding them to a 0-0 draw in the return leg was an amazing result for the underachieving/post breakup Arsenal, and Arsenal's friends all started whispering to each other how much better Arsenal looked, and that he seemed to be much more upbeat & positive and was showing signs of his old self. So of course in the quarterfinals they found themselves drawn against Juventus, the Italian giants who are about to be crowned Italian league champions and happened to sign a certain midfielder last summer by the name of... Patrick Vieira. Worse than randomly bumping into your ex, fumbling through some akward pleasantries before bailing out the door as soon as possible, this was the equivalent of learning that in 2 weeks you would definitely be seeing them at a mutual friend's wedding, and there was nothing that you could do to avoid it. Cue ridiculous aounts of anxiousness, akwardness, and mixed feelings all around. Both player and club would never admit it, but they still love each other, but current circumstances mean that they will never be together again. Many feel that PV4 left because he felt like he could have a better thing with Juventus, that he had a better chance to win club football's ultimate prize, The Champions League, with them rather than Arsenal, whom he was now bored with and felt like they had gone as far as they could go together. So how fatefully ironic that they should now be paired in the Champions League quarterfinals, where Arsenal have always failed in seasons past. Oh, and the first leg match would be played at the historic & famous home that they shared for 9 years, Highbury, which was built in 1913 and is about to be torn down in 3 months. This only added to the emotion of the occasion. So what happened? Arsenal came out as underdogs again, exchanged akward pleasantries with Patrick, and then proceeded to completely dominate & destroy Juventus. PV4 seemed in a haze, was thoroughly outplayed by Arsenal's 18 year old wunderkind replacent for him, Cesc Fabregas, and Vieira himself was dispossessed (by Pires of all people!!!) leading to Arsenal's first goal as they cruised to an emphatic 2-0 win. Even more, Vieira was yellow carded and would miss the return leg in Italy through suspension. This past Tuesday Arsenal held Juventus to a 0-0 draw in Turin, thus dispatching the Italian champions-in-waiting, and advancing to the semifinal of the Champions League for the first time ever. PV4, suspended, could only sit & watch, and what must he have been thinking as he watched the team he ditched leave him in the dust on their march to the only title lacking on Patrick's resume? PV4, stunned: does he wish he never left? This was the equivalent of showing up at said friend's wedding with your new girlfriend, running into your old girfriend, and then proceeding to be the most beautiful & dashing couple at the wedding reception, dancing perfectly, smiling, & laughing while everyone at the reception whispers to each other "who are those two? they are adorable!". Oh, and your ex-girlfriend is sitting miserably at her table, sulking at her self-imposed misfortune as her ex enjoys life to the fullest right in front of her, and her current is drunkenly hitting on the 18 year old barmaid for all embarrassed onlookers to see. So now Arsenal seem to have moved on, learned from the breakup experience, and become stronger for it. Onwards & upwards - they are in the last 4 of the Champions League and now that vital 4th place spot in the Premiership is within their grasp as well, and a state-of-the-art brand new 60,000 seat stadium awaits them in the summer. Simply stated, Arsene Wenger is flat-out amazing. 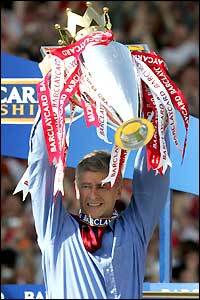 "One Arsene Wenger, there's only one Arsene Wenger..."
***I love PV4 -always have, always will, and I hope he does well at Juve and dominates the midfields of Italy just as he did in England. This piece might infer that I am bitter that he left, when the main point was to use the breakup/heal/move on metaphor for Arsenal 2005-2006. He got a warm reception at Highbury and they sang his song, and deservedly so. I wish he had stayed, but I wish him well, he is an absolute legend.